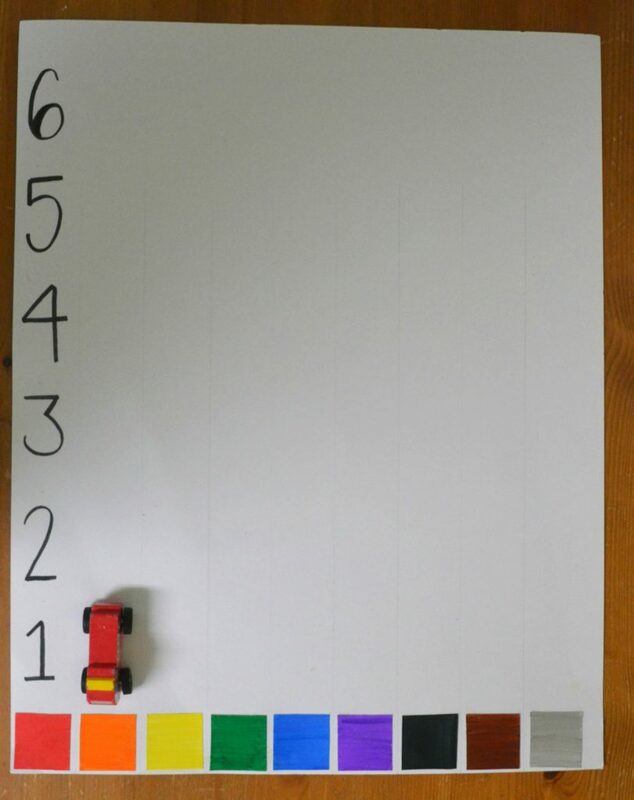 Help your little learn colors and numbers with this simple DIY Toy Car Parking Lot Activity! Some kids seem to be obsessed with things the day they are born. I’m pretty sure I came out bopping along to music, and everyone who has every met him knows that from the moment he was born, Ryan has been obsessed with cars. Yes, most little boys dig cars – I see that with Owen, who enjoys his big brother’s cars and trucks – but I’ve never seen a kid so completely obsessed with cars as Ryan is. I’m not complaining – I’ve found that I can manipulate that to my benefit and get him to do certain things with the promise of a car in my bag or ask him to, “go fast like a car!” I’ve also learned to use his utter fascination to my advantage by using it to help him learn. 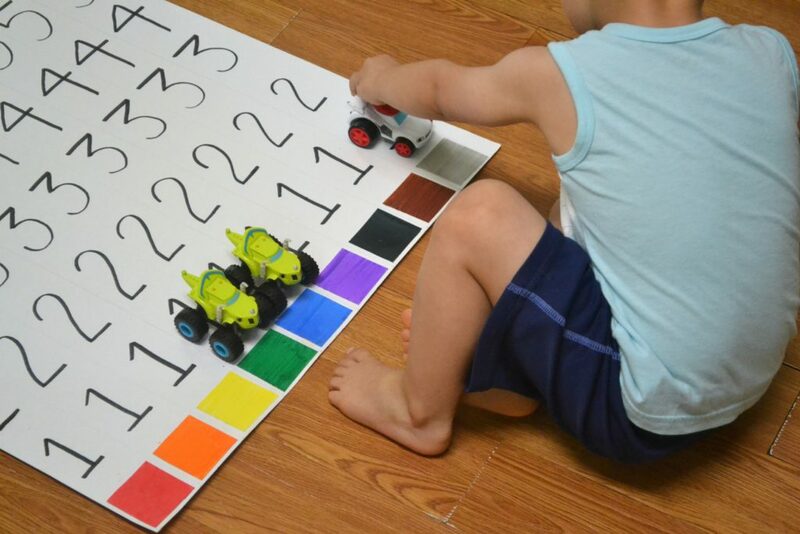 For example – take learning colors and numbers. I tried a few traditional ways of teaching them to Ryan – board books, songs, whatever – but he wasn’t into it. Finally, when I used my logic, I started asking and telling him which colors his cars were. 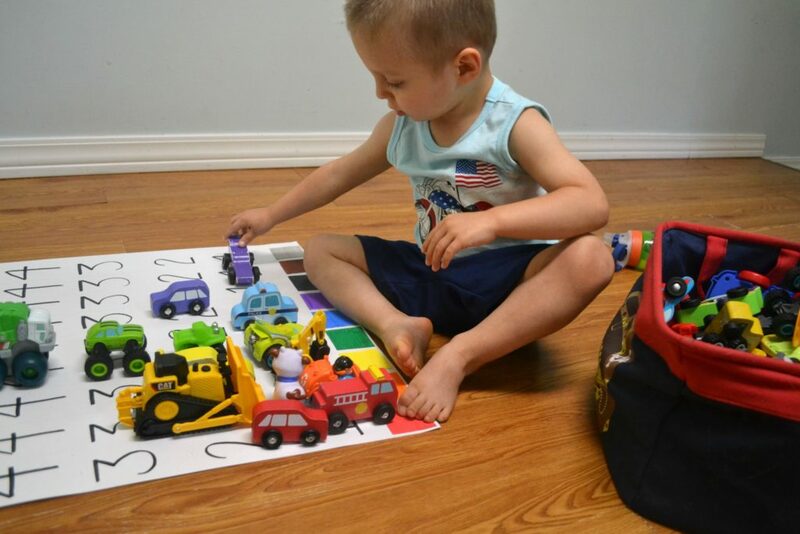 I started counting his bulldozers or fire trucks. And finally, it started to make a bit of sense to him. I love finding activities that Ryan can play quietly while Owen naps and I do little things around the house. 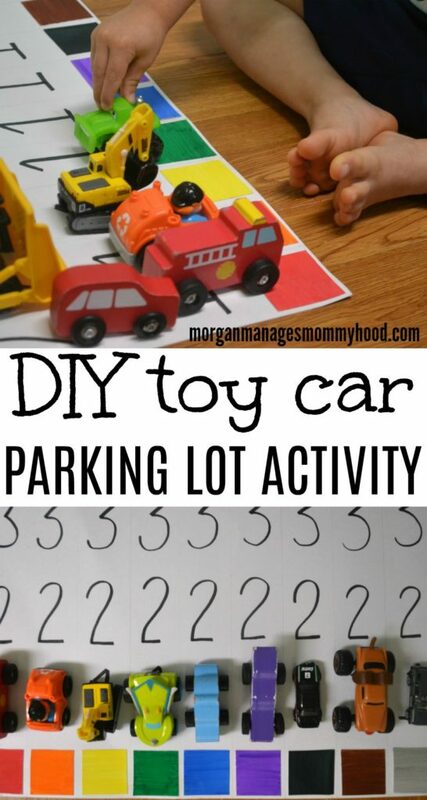 That’s why I put this little DIY Toy Car Parking Lot Activity together. 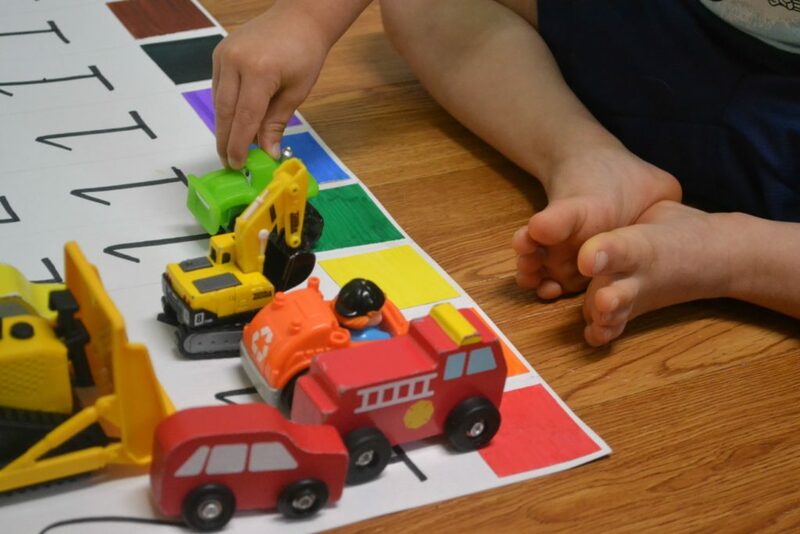 It’s the best of both worlds – small, so it doesn’t take up a ton of space and a simple, entertaining game that incorporates his favorite thing. Oh, and obviously you don’t just have to use cars. Really, anything will work. 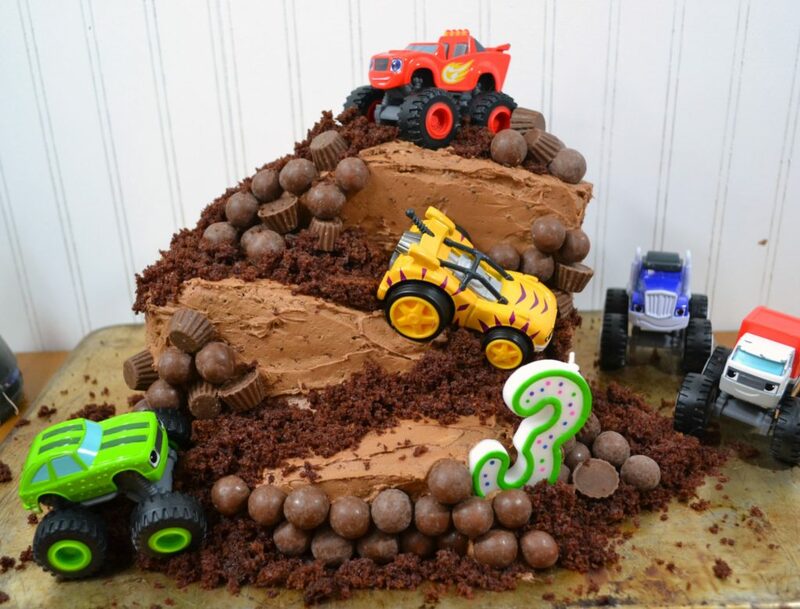 Farm animals, blocks, play food – whatever your kiddo is into! 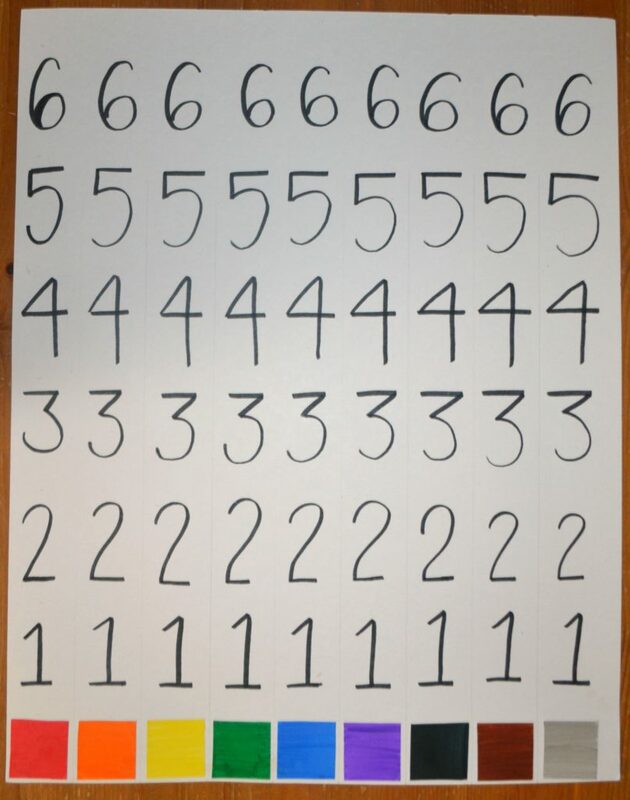 First, grab a large piece of poster board and divide the short length by the number of colors you plan on using. Take stock of your cars and see what colors will actually get used. 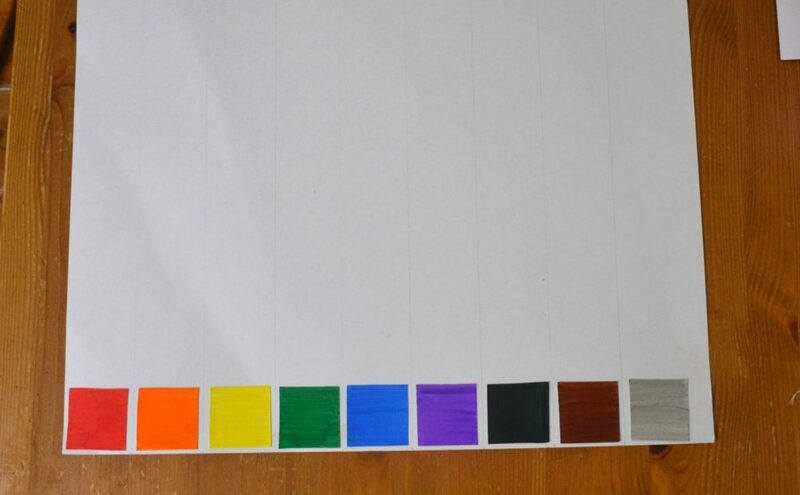 I used 9 – red, orange, yellow, green, blue, purple, black, brown, grayo. The number you’re aiming to find is how wide each ‘lane’ will be. Each of my lanes was about 2.6 inches, with a small excess at the last lane. Next, cut small squares out of paper that will fit in each lane. I wanted each of mine to have some white space between them, so I made my squares 2.4 inches. Color in your squares (you can also use colored construction paper) and allow to dry before pasting them in their lane. I put mine in rainbow order as another learning opportunity. Optional: Using the color of that lane (for yellow use a black pen over the marker to make it easier to see) write the color’s name above the square. Using a pencil, draw a faint line down the center of each lane. Lightly mark where each of you letters or numbers will go – these will create your ‘parking spaces’. You can measure your spaces by literally measuring a spot for each one, but I get kind of antsy with that kind of stuff so I took one of Ryan’s bigger cars and used that as my marker. This left me 6 spots with a bit extra on top. In each ‘space’ draw either a number or letter – depending on what you want to teach your kiddo – down your first lane. Ryan is really excited about numbers and counting right now, so I stuck with that. Once your first lane is filled, you can just use the approximate height across each lane. If you want, you can lightly make a mark on each lane to have an even height to each letter or number, but I wasn’t too worried about it. Once everything is dry, start playing! Put a bunch of your kid’s cars into a bin and sit down with him. I helped Ryan with the concept for the first few, but after a short while he understood and was pulling cars out and sorting them. 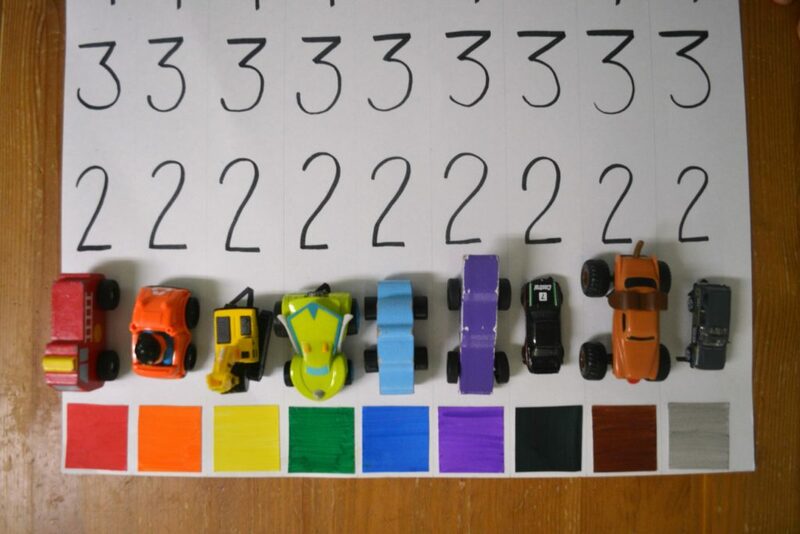 Help them understand what color each car is, where it should go, and what number car it is. For example, red car number 3. That would indicate a red car on the number 3, or the third in the red lane. Ryan loved to make a contest out of it, see which lane would fill up the quickest when he grabbed cars randomly. There were a few times when he would fight me on which went where, but I let it roll – it’s all a learning experience! 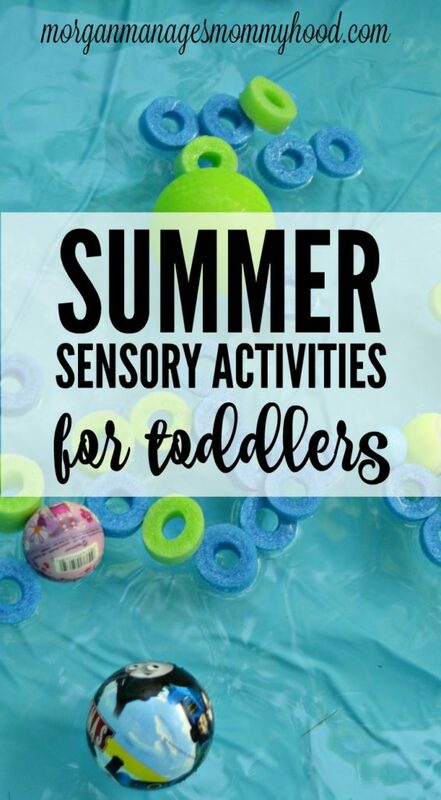 If your kid is like mine and loves to line things up, he’ll love this little activity, and you’ll love that there’s a bit more learning that just lining them up on the kitchen table. Okay, so tell me – what is your kid obsessed with? What are some quiet activities they enjoy? Let me know in the comments! I hope he loves it! It’s so fun!